Thank you for visiting us at Otomix Online. We run specials from time to time, so get on our VIP customer list by emailing us at OTOMIX3@AOL.COM... FUN ...FASHION ...FITNESS. 1. We accept Visa, MasterCard, American Express, Discover, PayPal. Minimum credit card charge of $15.00. All prices on this website are shown in US Dollars. 2. Sales Tax All orders delivered to California or Nevada as well as states that are now charging internet tax will be charged that appropriate state sales tax. We verify all billing information provided by our customers. Please enter your billing information correctly; otherwise, your order will be delayed for 48 to 72 hours. 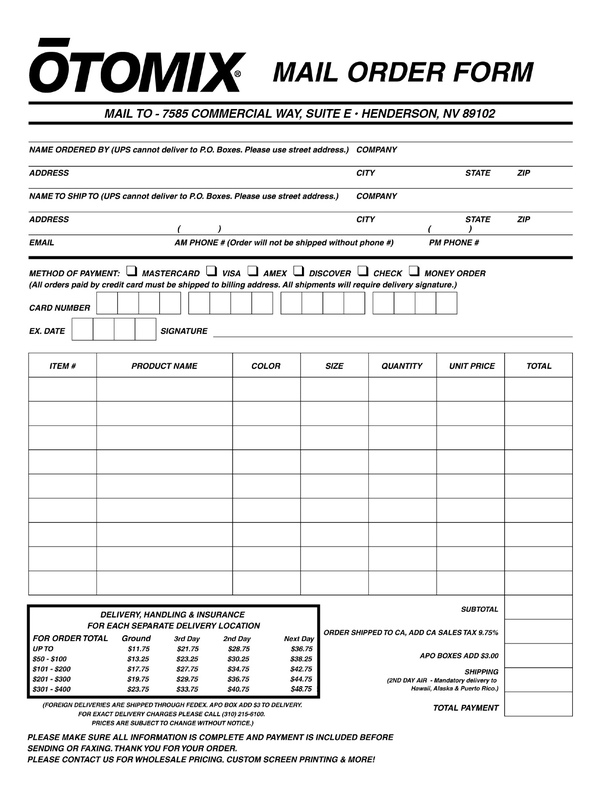 We only ship to the card holder�s billing address (Except if a P.O. Box) We reserve the right to cancel any order that is unable to be verified or process. *PRICES ARE SUBJECT TO CHANGE WITHOUT NOTICE* Note: OUR WEBSITE IS NOT LINKED TO OUR INVENTORY. PLEASE EMAIL CUSTOMER SERVICE @ otomix3@aol.com TO CHECK AVAILABILITY. Shipping and Handling Charges All fees and charges will be calculated and displayed after you have entered your shipping information and selected your shipping method. In order for our system to display an accurate shipping fee, please be sure to enter the correct shipping method. Otherwise, your order will be delayed. Please review the details of your order and inform us of any mistakes so that we can expedite the processing of your order. FREE SHIPPING is not valid on International, Canada or Wholesale orders. Orders being shipped to PR, AK or HI must ship 2nd-day delivery and shipping rate will be adjusted accordingly to the 2nd-day shipping rate. A $6.00 additional fee will be added to Military orders. 1. 2nd Day (2 business days for delivery) 2. Ground Shipping (5 to 7 business days for delivery) 3. USPS Priority Mail (for APO, FPO, VI, GU address) 4. International Shipping (Please read our International order policy) Important: We do not accept any customer's own shipping account (Federal Express, DHL/Airborne, UPS or any other company) for any order. All orders to be processed within approximately one BUSINESS day provided the items are in stock and there are no problems with the payment verification. Otomix.com does not guarantee same day shipping. Orders will not be processed on weekends and holidays. Orders placed on Friday after 1:00 p.m. PST will be processed on the Next Monday even air shipment, so Ground shipment will be more economical. Once a package is dropped off to our carrier for delivery, we will not have any control over the package; therefore, we can not make any guarantees after this point. In cases of errors or delays caused by the shipping carrier, we will help resolve the dispute at our best ability, yet we will not be held responsible or liable. Otomix.com requires an adult signature on any package over $100.00 in value. To CANCEL or MODIFY your order, please contact us at (800) 701-7867 before 1 PM PST or email us at OTOMIX3@AOL.COM. (1) We will not be able to cancel or modify your order after the order has been processed (normally 1 PM PST every day). Returns prior to 15 days of invoice qualify for refund or exchange. Merchandise must have original box and tags. Returns after 15 days are subject to approval and will be charged 30% restocking fee if APPROVED. All items accepted for return must be in the original condition, meaning brand new with tags. Footwear must be the original shoebox. There will be a 10% restocking fee for damaged shoe boxes. The customer is responsible for all shipping charges on returned merchandise. Shipping is Non-Refundable. Worn or washed items will not be accepted for return or exchange. No exceptions. Returned items with make-up, deodorant marks, stains, pet hair or traces of dirt will not be accepted for return or exchange. Items must be returned in resalable condition, with hang tags attached. To receive an RMA# please email our customer service departement @ otomix3@aol.com, please include your invoice # (located on the top center of your invoice) or your order number. Your package will be refused without a RMA #. Before returning the package back to us for any reason, please request return merchandise authorization by emailing our customer service department @ otomix3@aol.com ( a representative will review your request within 24 hours and issue the RMA number per our return policy. They may refuse to issue RMA number is the request not following our return policy After customers get the RMA number, please marked outside of the packages obviously. Any package without RMA # will be refused. A shipping quote will be e-mailed to you before processing your order. You will be responsible for any duty/taxes/custom fees upon arrival of package. We are not able to provide destination country tax and duty charge if occurred. Please check any restrictions, duties, taxes and any other fees which are collected from your country before you place the order. Otomix.com will NOT be responsible for any of the above Duties and Fees. The package will be returned to us and the shipping amount will not be refunded. This Website may include inaccuracies or typographical errors. Otomix.com and the third parties that provide content on this site may make improvements and/or changes in the products, services, programs, and prices described in this Website at any time without notice. Changes are periodically made to the Website. These Terms represent the entire understanding relating to the use of the Website and prevail over any prior or contemporaneous, conflicting or additional, communications. Otomix, Inc. can revise these Terms at any time without notice by updating this posting. Otomix.com, the Otomix logo, the original product images were taken by Otomix.com, and all Otomix.com-based trademarks are trademarks or registered properties of Otomix, Inc Worldwide and are protected by law. Unauthorized use of Otomix.com's Name, Images, Logos, and Trademarks or unauthorized copy of contents from this website without permission from Otomix, Inc in writing is in violation of U.S. and International copyright laws. Otomix, Inc will enforce all violations without exceptions. Opting out: Users can set preferences for how Google advertises to you using the Google Ad Settings page. Alternatively, you can opt-out by visiting the Network Advertising Initiative Opt-Out page or by using the Google Analytics Opt-Out Browser Add-on.